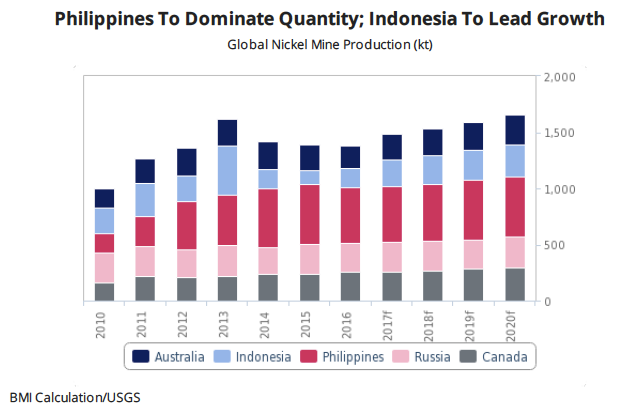 Global nickel production will come out of negative territory this year for the first time since 2013, driven by Indonesia's export ban moderation, a new report published Monday shows. Along with Indonesia, Canada and Australia will lead growth output rates from until 2021, while major miners in the number one global producer, the Philippines, will benefit from the ousting of anti-mining minister Gina López from government, BMI Research analysts say. Nickel hit a one-year low of $8,680 per tonne on the LME last week and is down more than 10% this year. World nickel production is expected to grow by an average 3.4% each year until 2021, the research arm of Fitch Group said in the report. However, production growth rates during the next five years will remain lower than the 5.3% average rates achieved between 2012 and 2016, they said, citing higher nickel prices experienced before the commodities slump as the main reason. While the Philippines will remain the world’s largest nickel producer in absolute numbers in the years to come, its global share of the market will gradually be reduced as ores are depleted and stringent environmental regulations choke new potential projects. 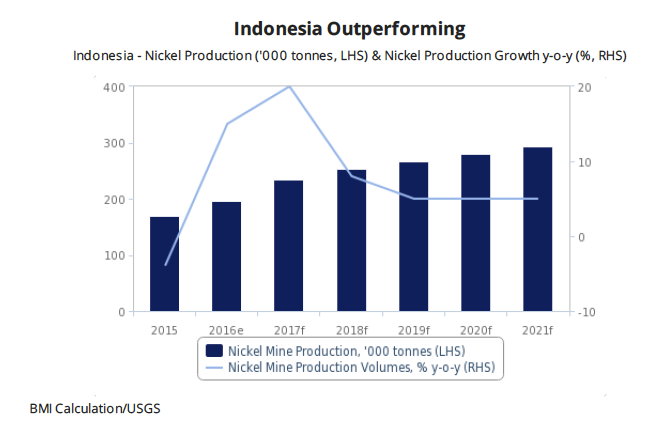 According to the analysts, the best performing country in terms of nickel output growth in the next four years will be Indonesia, thanks to the easing of the export ban, followed by Canada and Australia. 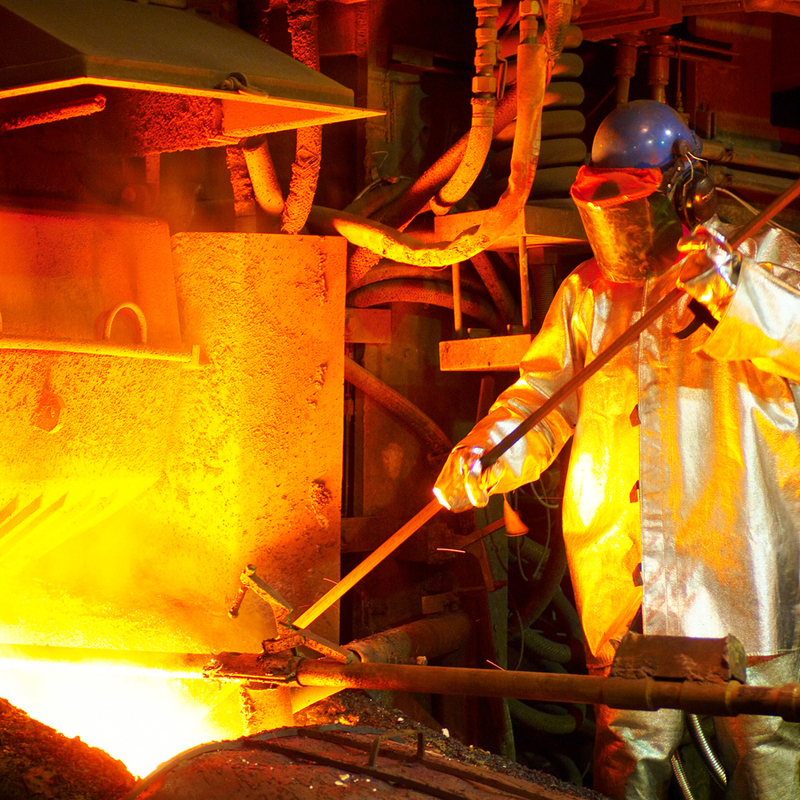 However, the measure is likely to affect investment in local smelters, with more than a dozen newly constructed ones already halted amid falling metal prices and other facilities operating at a loss, Jonatan Handojo, deputy chairman of the Indonesian Smelter Association told Reuters Monday. Russia, in turn, is expected to growth at the slowest rate of the top five major producing, which will likely make it drop from the fourth to the fifth place. As per December 2016, Indonesia and the Philippines accounted for almost 30% global mine production. Nickel prices have fallen this year to hit an 11-month-low of $8,700 per tonne on the London Metal Exchange (LME) last month amid concerns of rising supply from Indonesia and the Philippines as well as weak demand from stainless steel mills in China. If BMI predictions are correct and supply of the stainless steel ingredient is expected to jump, then prices risk staying at painfully low levels. Such trend was recently flagged by Goldman Sachs, after it downgraded its three-month, six-month and 12-month price forecasts to $9,000-per tonne from $12,500, $11,000 and $11,000 respectively. “We now expect that nickel prices will remain trading at very low levels through 2017 and much of 2018 until a substantial supply response both in China and outside of China eradicates our forecast surplus of 37,000 tonnes in 2017 and circa 100,000 tonnes in 2018,” Goldman wrote in its “Nickel: Low prices required,” note last month. Three-month nickel touched a fresh low of $8,680 per tonne on the LME last week and is down more than 10% this year. The metal was trading at $8,975 per tonne on Monday at 8:00AM local time.